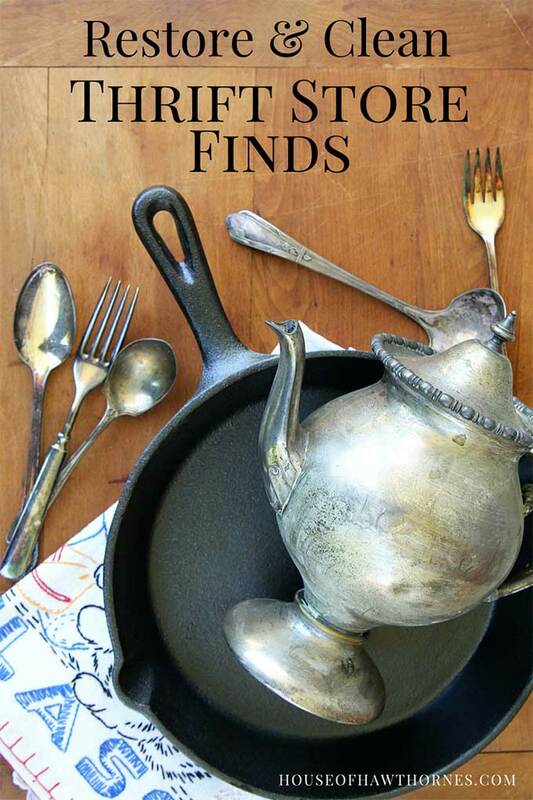 How to clean and restore thrift store finds, so you can LOVE them without buyer’s remorse. We’ve all been there. You’re scouting out items at the thrift store or at an estate sale and you come across an item that you would love to take home. If only it weren’t in such bad shape. A wooden cutting board that has seen a few too many blueberries. 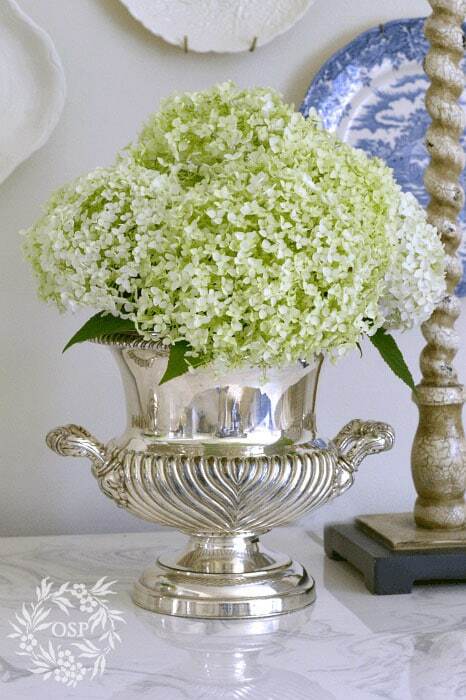 A silver tea pot that has been exposed to the elements since before Kennedy was President. A gorgeous linen pillowcase with the most intricate embroidery work, but looks as if Lady Gaga has been removing her makeup with it. I can’t help you with restoring the elastic straps on that old bra you found at Goodwill (why do they put that stuff on the shelf? ), but I’ve collected some tips from around the web on the best ways to clean thrift store finds that you actually should be buying. Do you have any idea how many vintage copper canister sets I have bypassed at the thrift store because they were so ugly? Ugh, I wish I would have known this secret before now! 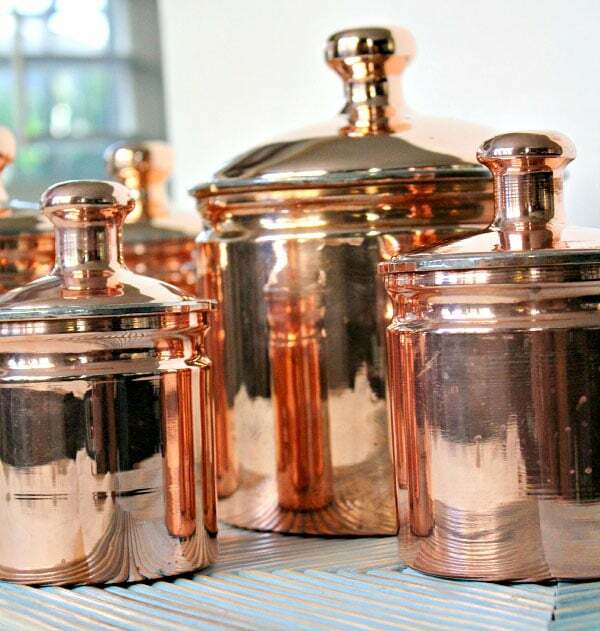 Fresh Idea Studio has an amazingly simple way for How To Clean Copper Fast. Now to just invent a time machine, so I can go back in time and pick up all those vintage copper canisters. Cutting boards are a mainstay of vintage and farmhouse kitchen decor and you can find some pretty cool ones at the thrift store. BUT (that’s a big but too) they are normally all gnarly, discolored and not too appetizing. 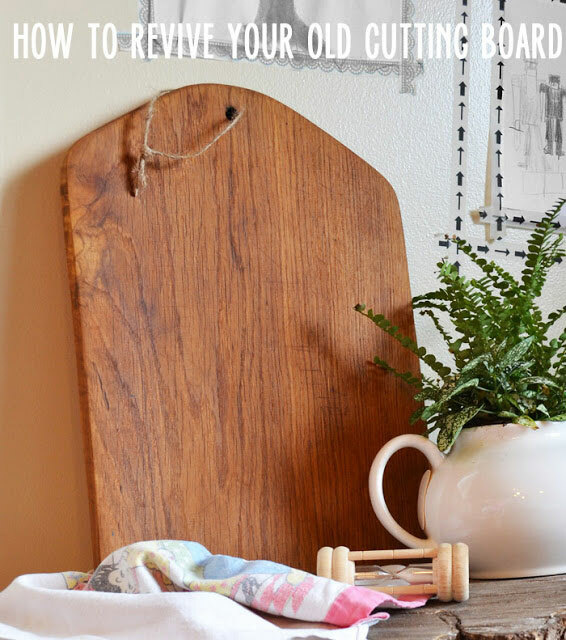 Gina at Shabby Creak Cottage shows you How To Revive Old Cutting Boards. I have a slight addiction to buying silver at the thrift stores, but I also have a slight addiction to laziness and thus leaving it in its “natural tarnished state”. But oh, that catches up to you real quickly and then you have to either clean it or watch it pit. 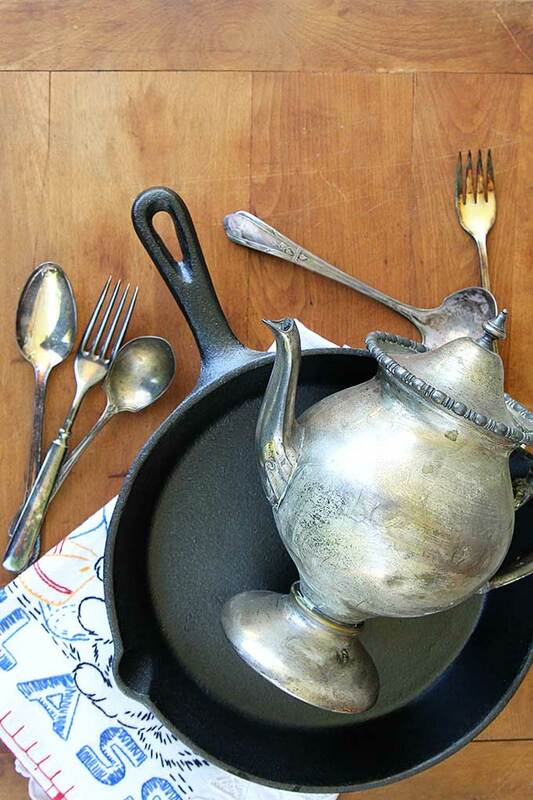 Ann at On Sutton Place has a great tutorial for How To Clean Silver Naturally. Naturally . . . as in none of that nasty paste stuff that gets all over your hands and under your fingernails! I love the idea of using a cast iron skillet. It’s all Little House On The Prairie meets Martha Stewart. And I see plenty of them at the thrift stores, but just always imagined all the elbow grease involved in cleaning them up. 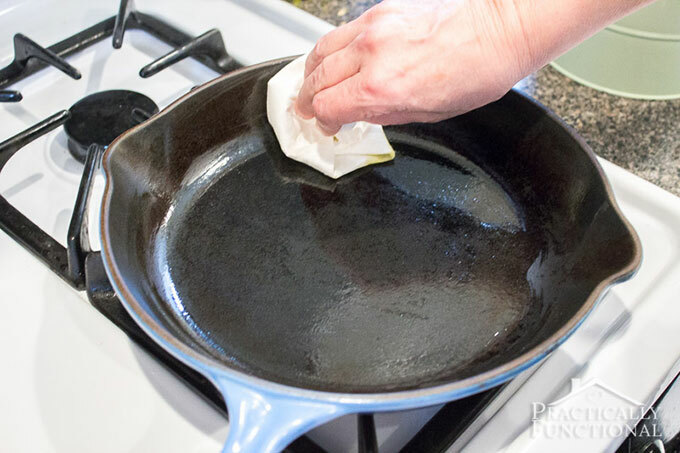 Jessi at Practically Functional has a great tutorial on How To Clean & Season A Dirty Or Rusty Cast Iron Skillet. It’s easier than you think. Heather at The Sewing Loft Blog has some simple tricks to bring vintage linens back to life in her post called Vintage Fabric – Reclaiming And Cleaning. A reader tagged me in a facebook post where she had purchased a very cool old coffee urn with Bakelite handles, but wasn’t sure how to make the Bakelite shiny again. I referred her to Retrofixes’ (love that name) tutorial for Restoring Vintage Bakelite. And there are so many things that were made with Bakelite that you probably never thought of. 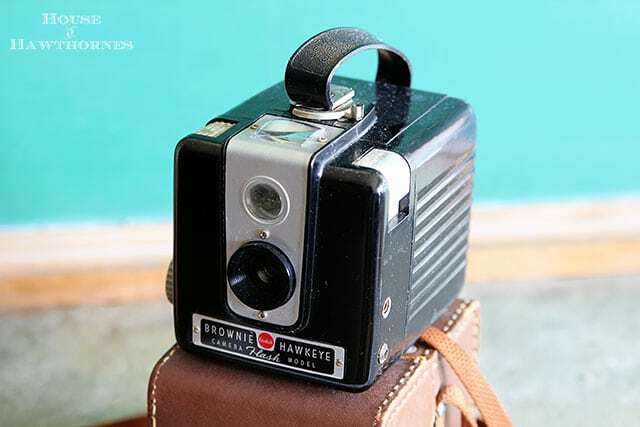 Like old Brownie cameras, ViewMasters, jewelry. It’s all over the place and needs a little love every now and then (don’t we all?). There is nothing more disappointing than spying a gorgeous leather suitcase at the thrift store and then opening it up to get a whiff of someone’s old socks and underwear. Seriously though, a lot of old suitcases were stored either in the attic or the basement and neither are good places if you want to stay away from mold and mildew. 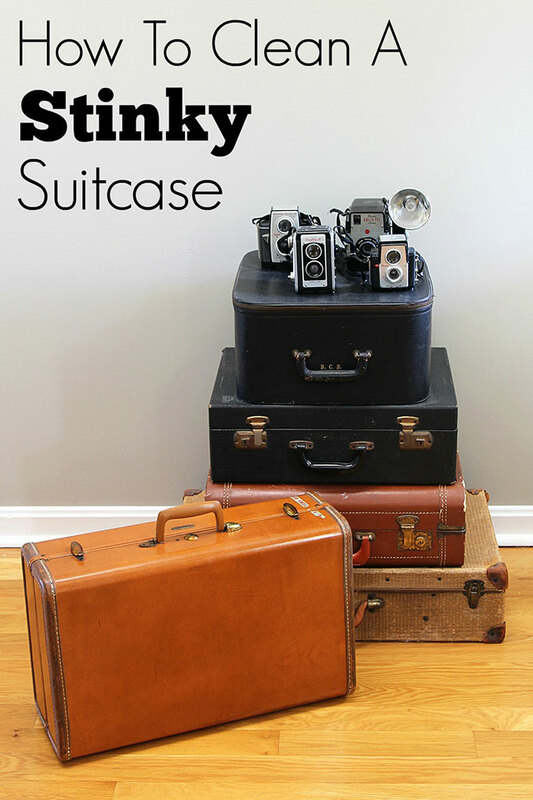 But no worry, you can get rid of the stench and live happily ever after with your find in my post titled How To Clean A Stinky Vintage Suitcase! 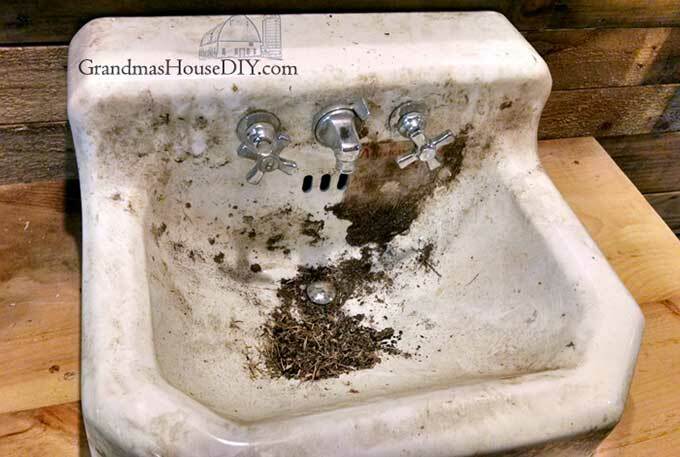 Tara at Grandma’s House DIY shows how she cleaned up and restored a cast iron sink. A VERY nasty cast iron sink at that! What tips would you give for restoring thrift store finds? And guess what? It’s Thrifty Style Team day, so head on over and see what the other thrifty girls have for you! Great information to have, so Imma-gonna-pin-it. You are welcome!!! And thanks for pinning! How about hints on getting musty book smells out? Oh, that’s a good one! I’ll look around and see what I can find on that one! Thank you for all the tips. I definitely can use them. I am so pinning these cleaning tips. Thanks for sharing. Thanks so much for putting these tips in one place! I can use ALL of them! Pinned. useful tips and hints… i liked the one about cutting boards. Before I forget: My wife and I were binge-watching Frankie and Grace (Lily Tomlin and Jane Fonda) through Netflix by mail. We don’t live-stream. We loved it and can’t wait until we can keep up with it. Love the shape of that tea pot. We had to get the mothball smell out of a dresser. My wife took the drawers and laid them out in the back yard when we were getting lots of sun and heat. (Now it’s raining off and on and will be until about a week from now.} I have a entry table that smells either like insect killer or oily tools. I can’t figure out which. So, it needs a good cleaning and sanding down a drawer so it fits. I hope we get the odor out of that one. Oh, I loved Frankie & Grace!!! I hope they’re making another season! My problem with binge watching is I watch then too fast and then have to wait another year for new episodes. Or, I watched the series called Girlboss about a girl who makes a killing on ebay by selling vintage clothing and then right after I finished watching the 1st season they announced they weren’t making any more seasons!!! I have been enjoying Lily Tomlin since Rowan and Martin’s Laugh In. Her characters are a hoot — Justine the telephone operator (Is this the party to whom I’m speaking? ), little Suzanne on her big, big chair (That’s the Truth, then “raspberries”), and I love her in her new role as Frankie. Maybe you’re not old enough to remember Laugh In? I love whatever she does because of her great personality. And, Jane Fonda…The whole family has always been a part of me, having a first name of Fonda! It’s the first thing people say to me when they learn my name. Either Jane or Henry, depending on how old they are, and I say don’t forget about Peter, the less popular child of Henry. Jane and Henry were great “On Golden Pond”. I don’t remember what else she did, but there are other things out there, I’m sure. 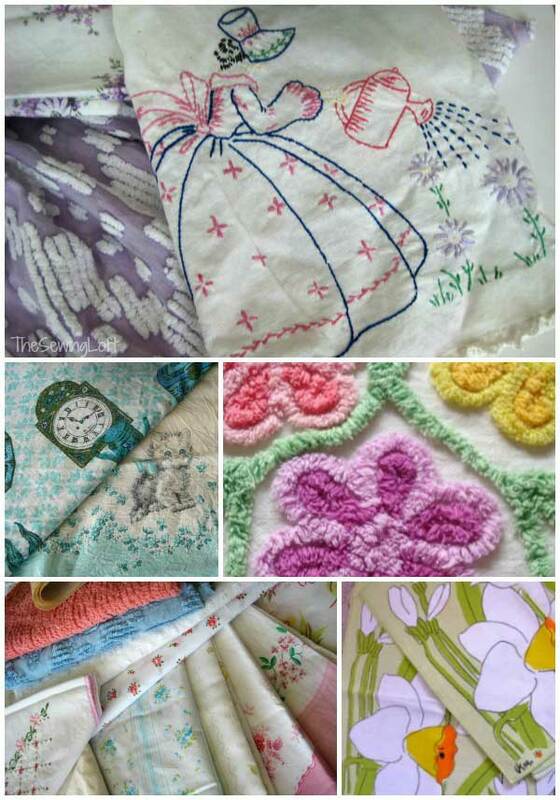 I am interested in the info on cleaning old bedspreads and linen. You gave what was suppose to be a link but isn’t. All the other links in this article are a different color and underlined. Please send me the link. Thanks in advance! Thank you for mentioning that! I’ve fixed it now, but the link is http://thesewingloftblog.com/clean-vintage-fabric/ . Great tips Pam! I need to clean some silver, so I’ll have to save this. Pinning! Pam – any tips on cleaning vintage glass pieces? I have a butter dish (yes, with a top thanks you!) that is all cloudy looking. I have used the eraser also soaking in vinegar, etc. and nothing has worked well. Would definitely be interested in your take! Thanks. Maybe a topic for a post if you have some great ideas for such things? This is fantastic information! We especially need the info about linens – we are always too afraid to take a chance. Thanks so much for creating a post with everything in one place!